Inducted 1995. Coached Christian Brothers to 126 Victories in Basketball. 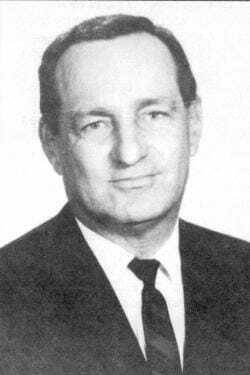 McClain was the first athletic director and basketball coach at Christian Brothers High School when the all-boys school opened in the fall of 1959. He had earlier coached five years at Aviston, one year at St. Dominic’s High School in Breese and five years at Mater Dei High School in Breese. A native of Quincy and a graduate of Quincy College, McClain also coached the Gem City Business College team here. His 19-year record as a varsity basketball coach was 316-178. In eight seasons at Christian Brothers, McClain’s teams were 126-71. He also coached the Raiders in baseball for two seasons, winning 36 of 42 games. He was elected to the state legislature in the fall of 1964 and continued to coach the Raiders while a representative. He resigned from the coaching position after the 1966-67 season, the year the Raiders had a 20-5 record. McClain was elected to the Illinois Basketball Coaches Association Hall of Fame. He and his wife, Marge, were the parents of eight children — Mike, Kevin, Kathy, Molly, Chris, Mary, Anne and Pat. McClain died of a heart attack in June 1972.